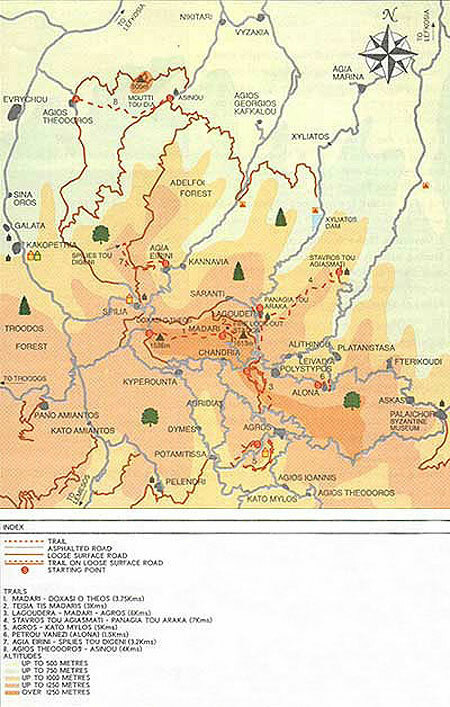 A mountainous region east of Troodos, of which the most important villages are Palaichori, Agros, Alona, Askas, Polystypos, Platanistasa, Kyperounta, Pelendri, Chandria, Dymes, Agridia and Kato Mylos. The region is fled with rare natural beauty and a large variety of ecosystems and landscapes. The natural Pinus brutia forests together with the thickets of the endemic Gold Oak Cover large areas. The main products of Pitsylia are apples, pears, cherries, peaches, grapes and seasonal vegetables. There are 3 noteworthy Byzantine Churches in the area, which are included in the official UNESCO list of the World Cultural Heritage. The following 8 nature trails are found in Pitsylia. Starting point: "Doxasi o Theos" (Glory to God) 2 kms from Kyperounta and 5 kms from Spilia. Length: 3.75 kms Time: 2 hours. Points of interest: A panoramic view from an altitude of about 1600 m.
Starting point: The end of the previous trail. This trail follows a course around the Madari peak where a Forestry Department Fire Station is situated and ends at the road that leads to this Taking this road will lead to the starting point. Points of interest: The very high spectacular cliffs along the trail offer exceptional scenery. Starting point: The trail begins at the country road at Lagoudera under the "Koukkides" cafeteria, continues past the Polystypos - Lagoudera - Madari crossroad, then takes a loose surface road for 2.6 kms and reaches the Madari-Papoutsas mountain crest. From this point the trail has two forks. One fork (I) leads down the hill towards the Agros dam I and ends at the village. The other (l1} follows a course along the crest and continues along a secondary road which leads to the Madari Fire Station. Points of interest: The trail passes through vineyards and orchards of apple, cherry and pear trees. The first fork runs parallel to the Lagoudera river, which it crosses at two points. The Madari-Papoutsas crest offers a panoramic view in all directions. Starting Point: Lagoudera or Stavros tou Agiasmati 3 kms from Platanistasa. Length: 7 kms Time: 3 hours. Points of interest: The church of Panagia tou Araka (1192 AD) and that of Stavros tou Agiasmati (1494 AD) both with beautiful wall paintings are among the nine Byzantine churches of the Troodos area included in UNESCO World Cultural Heritage List. The trail passes through a pinus brutia forest, vineyards, almond trees and old stone terraces. To the east of the trail we can see Kionia, to the north Morfou valley, Pentadactylos range. Xyliatos dam, Mount Olympos to the west and Madari to the south. Points of interest: Apple, cherry, and pear orchards, vineyards and rose gardens, which give the famous Agros rosewater.